The thing about a terriers is, once they’ve decided to do something, not much holds them back. So when Tucker developed a lick granuloma, we had to bring out the big guns to keep him from obsessing over it. And by big guns, I mean the cone of shame big enough for a Great Dane. Even then, our insistent pup found a way to use the sharp edge of the cone itself to scratch his itch. Poor dog; he must be really uncomfortable. But we’re treating his itches with Apoquel, and it seems to be working. Until he’s healed, Tucker will be wearing his radar disk and a sad face. But don’t feel too bad for him; our intrepid dog has figured out how to play ball even with the cone. Text from Dog: Mud. Bath. 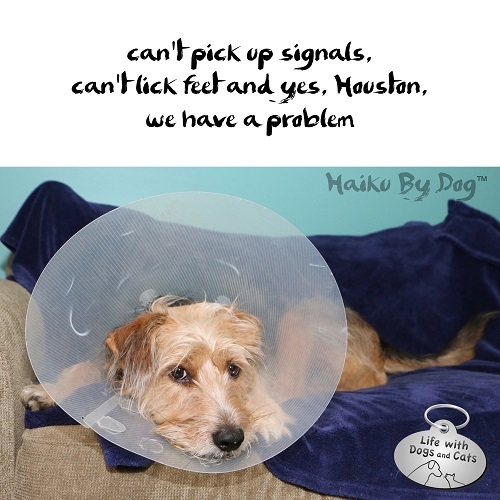 11 Comments on "Haiku by Dog: Problem"
Poor baby! We had to use a soft cone for Daisy both to keep her more comfortable and to prevent her from using the edge to scratch her stitches (this was after her ACL tear). The edge of the collar glowed in the dark, and I can’t tell you how funny it was to see a seemingly disembodied ring moving through the house! I hope Tucker can shed his cone soon. So Daisy figured out how to use the edge, too. Smart dog. We have to cycle through hard-edge cones, soft-edge ones and leggings. Whatever works. 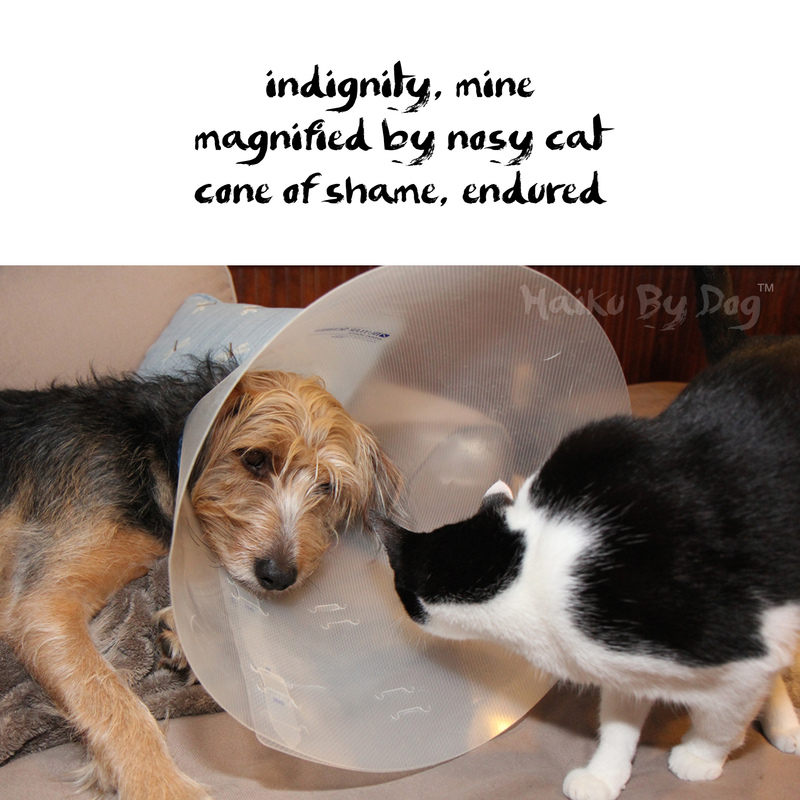 We call it an Elizabethan collar and tell our dogs they are auditioning for Shakespeare’s plays. Lick granulomas are no fun. They recur. And they’re terrible for a terrier like Tucker. We have to catch them before they get too big. Thank you! He’s doing better. That has worked in the past for us with other issues — just watching. But the lick granuloma must be really irritating, because I would have to sit next to Tucker with my hand over his paw to stop him. I’ve read stories of dogs that when they can’t reach one paw, will start licking on another. It’s a tough issue to beat.